The latest Linux products, in contrast, are obviously better than their predecessors – it’s mostly with respect to installation procedures and oddball hardware support, but essentially every new distribution is genuinely preferable to what came before. So I downloaded it to work alongside KDE 3.5 and wow, is it awesome! It’s almost like an entirely different program, making my darling Ubuntu Gnome desktop look a little boring itself. I may even do a fresh install of Kubuntu in this partition with KDE 4, then upgrade to KDE 4.1. In any case, I’m sure I’ll report back with more to say! Managing e-mail is made easy with the use of e-mail client, also known as e-mail reader. Some e-mail clients can also function as feed reader and can support plug-ins and themes. When it comes to picking the right e-mail client, Linux users have tons of choices. I have here a list of 8 of the best free and open source e-mail clients that are available for Linux. For those rare people who don’t know, Canonical’s Ubuntu distribution is basically Debian Sid (the unstable version) plus a few GUI apps and modifications. Debian is one of the most successful community-based distributions. What Do Small Open Source Projects Do With Money? Not Much. Thanks go out again to Sandisk for creating such a great PMP product, and for supporting the FOSS and Linux communities by powering their hardware with Linux. Apple tries to shut down El Tunes – Viva La El Tunes! Is Microsoft getting ready to kill Windows? How big is the free economy? IETF tackling P2P data traffic in Tokyo even though the same content is available on a server in London. Microsoft to ODF supporters: you won. Microsoft to press: OOXML is winning. Earlier on we wrote about Microsoft using its patents offensively. It keeps claiming to be a victim, but it’s nothing more than double-speak — a case of buttering both sides of the toast. Since Microsoft sues using its patents in an unprecedented fashion, people begin to react. There is nothing extraordinary here, but Microsoft tried to justify going hostile. Bruce Perens brings back memories of the confidential E-mails predating (if not preluding) the SCO lawsuit. He seems very convinced that Microsoft had a hand in it and he’s looking for more ‘smoking guns’ so that he can share his research in high-reach press (maybe trade journals). News publications are cautious about making accusations, and because of that, some nasty acts of Microsoft are essentially being erased from the record. Microsoft convinced Baystar Capital to put $50 Million dollars into SCO’s lawsuit against IBM and other Open Source users, and promised to “backstop” Baystar’s investment if SCO lost money, according to this sworn testimony. But I’m told that one person’s testimony, even sworn testimony, isn’t proof. I’ve left a comment there with some more details. I published an article about it before (also here), but according to Pamela Jones, a judge’s confirmation is still needed. “The road to OOXML has been riddled with Microsoft corruption.”Some of the examples given there are from the OOXML fiasco. We wrote about this earlier today. A ZDNet article now cites CompTIA. It’s a Microsoft lobbying arm that fought for OOXML (Van Der Beld [1, 2, 3], anyone?). Total loss of credibility there, for sure! History is being rewritten. The road to OOXML has been riddled with Microsoft corruption. From start to finish. It is all well documented. Interestingly enough, they also quote Microsoft’s Oliver Bell, who seemed to be concerned with BoycottNovell’s exposure of the corruption (he asked about us). Gray Gray Knowlton too was concerned. Might they end up escaping the company like others already have following the embarrassment and breaking of laws? The EC has yet to slap Microsoft with heavy fines when the investigation is complete. The market cannot take care of itself when abuse becomes the ‘norm’. The Fortify “Get the Facts” campaign (against Free software) was only mentioned very briefly here. It came in the form of a warning (it was also included in some link digests). Security companies are funny creatures because they naturally love insecure software. They love breaking software apart and fear means business to them. Lying is never a problem, no matter the consequences. Moreover, Free software, which is inherently more secure, is a true danger to the business model of security agents, so they fight without tact or mercy [1, 2, 3]. Groklaw adds: “Yes, folks. This partner of Microsoft is the same Fortify Software that put out that “study” that concluded that “Open Source” (but actually only Java) is risky.” It smells like a case of fitting data to an hypothesis and a sensationalist conclusion, and at the same time hitting two rivals of Microsoft: Java and Free software. They didn’t assess proprietary equivalents. They wanted to encourage businesses to buy products from them. Furthermore, according to this, once/if you looked closely, you would find that proprietary products were shown to be more — not less — defective than Free software. So what has Fortify really proven? 1. There are other security toolkits other than Fortify. Just because you don’t use their system doesn’t mean you don’t care. 2. When reading vendor-sponsored studies consider the source. Always a wise move. 3. Open source projects in Fortify’s Open Review report fewer defects per thousand lines of code than proprietary products in the same review. I didn’t know that. Fortify may also have some junk software patents, such as this one on “security testing”. Fortify SCA helps security, testing and development teams pinpoint and eliminate security vulnerabilities in software applications. Fortify’s patent-pending technology delivers the most accurate and reliable results with low false positives..
“There should really be an index somewhere to tell who’s with who.”Watch who Fortify built an alliance with: Wipro, another Microsoft partner that’s joint to it by the hip and lobbies for OOXML — all against India’s interests [1, 2, 3, 4, 5]. Fortify lives in a not-so-healthy neighbourhood of proprietary software companies that combat Free software and encourage software patents. The apple doesn’t fall so far from the tree. Whitehurst: I joined because I believe in the mission. I’ve been a Fedora user for years at home. Economically, it is a fundamentally better way to develop software. One thing I love about the company is it’s a great confluence: when we do well as a company, we do good for the communities of use and societies around us. The last thing that wasn’t open-source was Red Hat Network, and we just open-sourced it. We’re all in. We are and should be leaders in open source, and that’s the right decision for our shareholders as well. The Openmoko Neo Freerunner phone was released only a few weeks ago, and already, a customized version called the W.E. Phone is now available for purchase. So what’s the difference between the naked-as-a-baby Neo and the Canadian-based W.E.? The latter comes with a full bundle of custom Google applications, on top of the core GNU/Linux OS base with dialing, SMS and contacts. Boasting a switch to RPM packaging, Moblin 2.0 is designed for MIDs based on the Intel Atom processors. GTK+ is a widely-used cross-platform toolkit for building graphical user interfaces and for rapid application development. GTK is open source and freely downloadable, and available for the development of free and commercial software under the GNU public licence. The MPAA says the sites contribute to and profit from copyright infringement by identifying, posting, and indexing links to infringing content on the Internet allowing people to then view on-demand. A couple of readers have asked us to cover what initially seemed like old news. Slashdot picked it up some hours ago, the the story appears to have been reborn. It’s about Microsoft treating GNU/Linux on a dual-boot system like it’s garbage, throwing it away under the guise and excuse which is “security”. Blocking of access to old file types due to so-called “security issues”. Why fix some undisclosed flaws when you can force an upgrade (more revenue)? Is OOXML really more secure or is it somewhat of a back door? Then there’s the story about Microsoft trying to block virtualisation (of GNU/Linux of course) using a EULA, thus putting limitations also on the BIOS. Microsoft’s excuse was “security”, but antitrust interference had them give up the charade. It remains to be seen how it ends up. At the moment, almost 1 in 2 Windows PCs is a zombie PC. When Microsoft speaks of dual-boot, i.e. GNU/Linux, as a security hazard (as opposed to ActiveX, back doors, and other cracker- or government-friendly ‘facilities’), one can hardly keep a straight face. 1. Microsoft treats its customers like they’re stupid. I’ve had this complaint for a decade. 2. Microsoft embarrasses Mojave participates. 3. The marketing campaign blames customers for Vista’s problems. 4. Microsoft denies there is a real problem. 5. Mojave seethes with arrogance. There is evidence that may suggest ‘massaging’ of statistics, too. The numbers reported are inconsistent, which may or may not imply that observations not supporting the hypothesis simply got discarded. Last night, as I was drifting off to sleep, something stuck me about Microsoft’s Mojave Experiment that hadn’t clicked when I first watched it. Out of the 140/120 participants (the number varies depending on the source) that Microsoft say took part in this experiment, we don’t actually seem to hear from that many. Why? Remember the bogus Novell/Microsoft survey, which enables sales people to pretend that people like this deal? See the quote at the very bottom. Just days ago there was this report, which shows that Microsoft is still paying for ‘studies’. Quocirca, a research and analysis firm, released a comprehensive report sponsored by Microsoft (News – Alert) titled, “On Premise and On Demand”. As for Novell/Quocirca, there is only a very loose tie here. In Microsoft’s case, on the other hand, manufacturing of ‘studies’ is routine. Remember Forrester attacking GNU/Linux on Microsoft’s budget? How about Gartner and the Yankee Group? This industry of analysts and so-called researchers is a joke as long as it shamelessly serves companies rather than genuine curiosity. It’s marketing in suits, not research. We do not typically write about (or bash) Microsoft products because that brings attention to them. Negative publicity too is publicity and we made rare exceptions when we looked at SP1 of Windows Vista and at Home Server. There’s a much broader history to Vista lies, but we won’t explore it further in this post. “We need to engage with Windows administrators – this stuff runs on Windows,” Ramji said. For more from Ramji on how Microsoft surrendered sovereignty to the Open Source Initiative, on chief executive Steve Ballmer’s apparent rapprochement with open source – just don’t mention the “L” word – and how Microsoft won’t be open sourcing Windows, you can download George’s 11 minute podcast here. Remember what Microsoft has in mind. 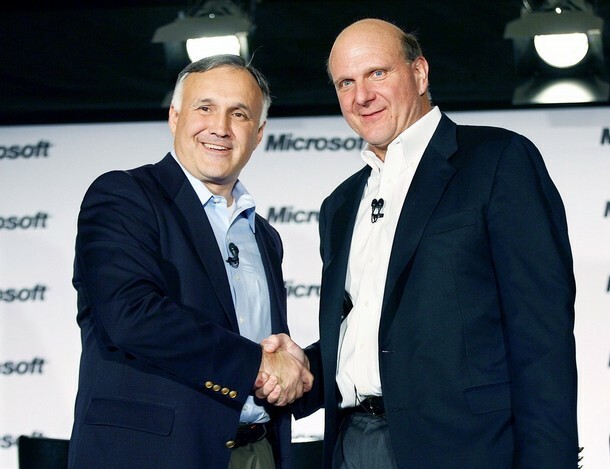 As Steve Ballmer once shouted (and even damaged his vocal chords in the process), it’s "Windows Windows Windows". The Ramji/Clarke-like series isn’t an isolated incident and it never stops. Remember how Microsoft raves about its control of the press and its ability to push so-called (pseudo) ‘open source’ figures into the headlines. It even says so in a job description. The first questioner from the audience wanted to know what it would take for Microsoft not to claim patent infringement violations in open source code. His inquiry was followed by whoops, whistles and thunderous applause. The next question was about trust, as in why should we trust you this time? And the next referenced what the questioner called the “Office Open XML debacle” and accused Microsoft of using its power to buy international standards. To explain what has happened here, consider this: Microsoft attacks Free software at the back and uses people like Ramji as a punch bag to absorb criticism and make critics of Microsoft look ugly (because, hey, Ramji didn’t say anything to aggravate, did he?). For similar reasons, female representatives are sometimes used to mitigate a verbal assault. It was a similar situation in OSBC 2008 [1, 2, 3, 4, 5]. Now, when it looks like the world really does want ODF instead of OOXML, surrogates are sending a dual message — first, that ODF has won, so OOXML isn’t worth fighting any more (and anyone who does is an “extremist” anti-Microsoft whiner), and two, that OASIS isn’t able to do a good job with ODF, so the same folks who brought you OOXML should take it over. In the same vein, the message Microsoft delivers to us now is that Microsoft just loves open source and if someone complains about it (or — God forbid — insults ‘poor Ramji’), then that someone is “an “extremist” anti-Microsoft whiner,” to repeat the wording used above. It’s a moral shield which used to ensure that the Trojan horse can penetrate the very centre of Open Source City and then change its governance. There is actually a lot more of the same in ODF/OOXML. Alex Brown [1, 2, 3, 4, 5, 6, 7, 8, 9, 10, 11, 12, 13, 14, 15, 16, 17, 18, 19, 20, 21], for instance, played innocent a while ago by issuing an apologetic press release. Microsoft pulled the same type of stunt. The purpose was to shut up critics and make them look bad by pretending that Microsoft had already lost. “CompTIA,” eh? Does it not matter who pays the wages there?